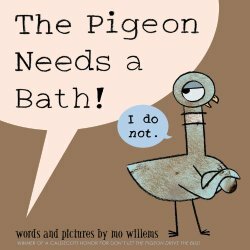 ﻿ Sonderbooks Book Review of The Pigeon Needs a Bath! Review posted July 8, 2014. Hyperion Books for Children, New York, 2014. 36 pages. This one follows the pattern of the other books, with its own little twists. Once again, the child reader gets a taste of parental responsibility. The pigeon is indeed filthy, as any child will readily agree. But he has plenty of arguments as to why he really doesn’t need a bath. And when even the flies think he smells too bad to be near, he has lots of complaints about water temperature and depth and amount of toys. Yes, Mo Willems knows kids! I had the privilege of reading this book to a 5-year-old girl who has Don’t Let the Pigeon Drive the Bus! memorized. She was delighted. Another hit from Mo.